Registration has closed on the third and final starting flight in the @WPTDeepStacks $1,100 Main Event and the board shows 409 entries. This pushes the 3-day total to 724 entries, creating a prize pool of more than $700,000 - official numbers due out shortly by BenErwinPoker and JohnQTD. 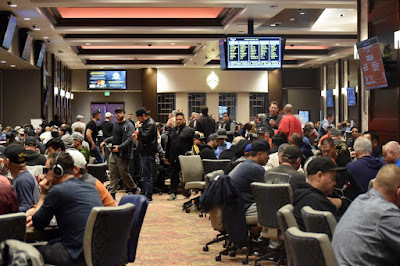 Play continues tonight until 11:45pm - the end of Level 15 - when the remaining players bag up their chips to join the 67 already moving on to Sunday's Day2Restart at Noon.